Andrea Bain is an author, podcaster and on-air personality. Most recently she was one of the hosts of the national lifestyle program The Goods on CBC. Her charismatic, adventurous, down-to-earth personality energizes audiences on-screen and in person. Andrea's charismatic, adventurous, down-to-earth personality energizes audiences on-screen and in person. A two-time Canadian Screen Awards nominee, Andrea has hosted a number of lifestyle programs including Live Here Buy This (HGTV), Revamped (Slice) and Three Takes (Slice). Her television career began in the newsroom at CTV and Global News. She worked behind the scenes as a producer and, shortly after, landed her first reporting job. 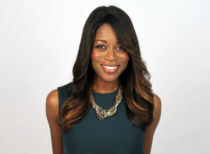 After some encouragement from her peers, Andrea decided to step in front of the camera full time and became an entertainment correspondent for the Los Angeles-based TV station Reelzchannel and HLN’s Showbiz Tonight where she interviewed such notable names as Oprah, Brad Pitt and Martin Scorsese. Andrea has appeared regularly as a relationship specialist on various Canadian daytime programs. Most recently, she has used her relationship expertise to pen her first book, Single Girl Problems. Her podcast of the same name, delivers candid conversations about topics ranging from pop culture to relationship issues. The weekly show features high profile guests including experts, celebs, married, divorced and of course single people.